SAM is a powerful and extremely advanced broadcast automation technology that has been continuously undergoing development now for over 4 1/2 years, specifically to fully meet the "specialized" needs of online broadcasters. It also directly supports the PCI MAX ULTRA card! Both MP3 and Windows Media 9 streaming support, dual player decks, advanced playlist management & rotation logic, drag&drop management, real-time listener statistics, voice over/mic input, sound FX module, advanced crossfader/gap killer (no soundcard required! ), automated requests & dedications, automated cd/album cover retrieval, complete and "legally" required RIAA/DMCA Sound Performance Accounting/Reporting features, full 24-bit PCM audio output, multi server support including - Live365, Shoutcast, Icecast, Windows Media and much much more! SAM2 is "Powerful Technology" For The "Serious" Broadcaster! 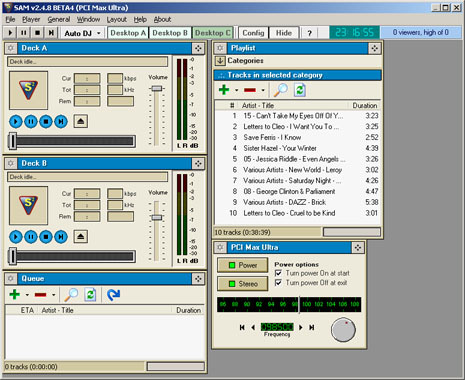 No other broadcast automation software currently provides as many features..
SAM was initially developed beginning in early 1998 to better meet the needs of small online Shoutcast and Windows Media broadcasters who could not afford conventional radio automation tools that cost thousands of dollars to license each year. Over 4 years later, we have finally arrived at SAMv2 RC 1, which in most all aspects is more powerful than most traditional radio automation systems - but still costing 100 times less! Regardless if you are a Home user, Hobbyist, Small Commercial or a Terrestrial broadcaster - you will absolutely love the power and features incorporated into SAM2. But don't take our word for it - download it and prepare to be amazed! 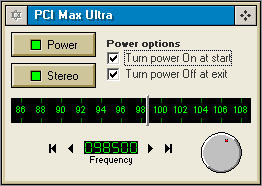 PCI MAX ULTRA is directly supported by SAM2! - This allows you to report to SoundExchange, ARPA or any other such entity in order to be fully legal. More features coming soon! Check the readme.html file in the SAM help documentation. Click here to download evaluation version! Perfect companion for our PC based PCI MAX transmitters!